One day it’s just a few stuffed animals, some teethers, and a push-toy. Then you blink, and suddenly there are LEGOs and action figures and dolls. Blink again and there are science kits and remote-control cars, Hatchimals and Polly Pocket sets. Before you know it, you’ve acquired something of a small empire of children’s toys. We know you love watching them play, and we know you also go a little crazy when they leave their things everywhere. When you’re looking at the best depository method for your kids’ toys, consider how special a personally picked toy chest might feel. Kids love bright colors, fun patterns, and seeing their favorite characters on the furniture in their rooms, so brighten up the cleanup process with one of these fantastic toy boxes. 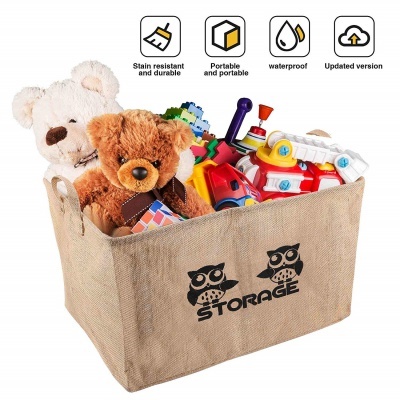 This page was recently updated to include a couple of new toy boxes and depositories options that meet our high standards of criteria and have numerous positive parent reviews and high ratings. Additionally, all product information was researched and reviewed to verify accuracy. We love the bins. They are of the right size so your kids won’t have trouble carrying a bin or two to their play area. It comes in a variety of 4 colors too, which can help reinforce their color mastery. Tired of stepping on legos and tripping over balls? 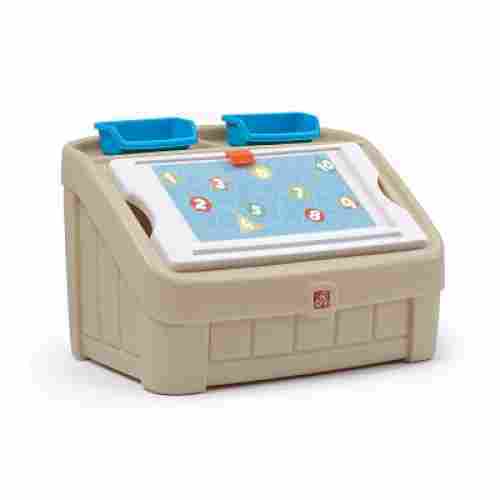 The Tot Tutors Kids’ Toy Depot Organizer is perfect for your family. This depot organizer holds three plastic bins on each of the four shelves. When purchasing you can choose from a variety of color schemes to fit your household. The bins are easy to remove which will help keep your house clean and organized. Your child can simply remove the bin holding the activity of their choice, play with that activity, and then put it back when they are done. Assembly is required but it is also very easy. This shelf is made for toddlers and preschool children as it is their height. They will build their independence as all the toys are in reach and they can get everything themselves. You can get creative and decide how you want the toys organized. Whether you organize their toys by colors, shapes, or activity their recognition and problem- solving skills will improve. 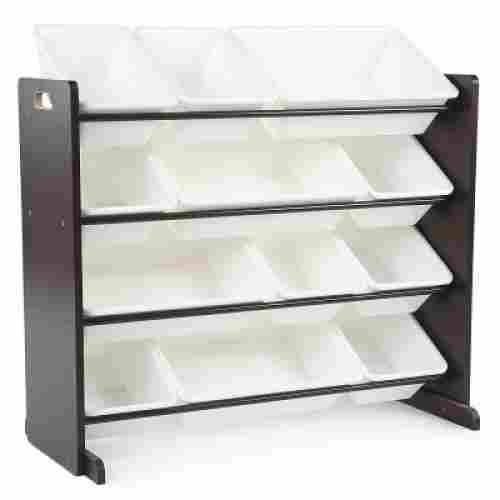 Made of wood and plastic, both the shelf and bins are durable. The materials of this product also make it easy to clean. Your child will learn responsibility as they work to keep the household clean. The design is so simple yet very functional. The inclusion of 2 smaller bins can help any kid master his or her organizational skills by placing smaller toys only on the bins and not on the chest. With a depot space of about 6 cubic feet, your kids will simply love putting their large toys on the Little Tikes Primary Colors Toy Chest. 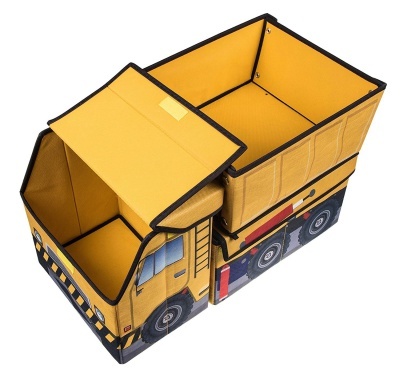 This toy chest comes with 2 removable bins located underneath the toy chest, perfect for smaller toys. Its detachable lid can allow for the depot of bulkier playthings. 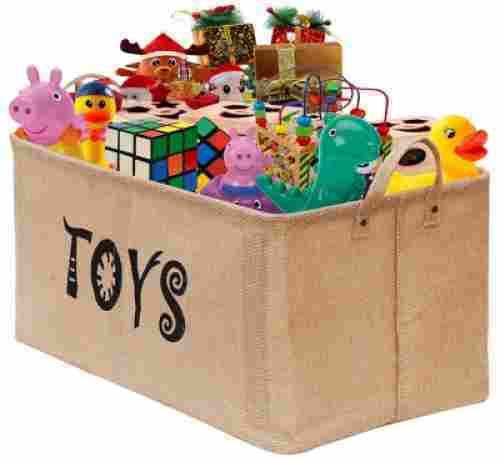 This is a very good basic toy chest for a young child! It can be for miscellaneous toys, odds and ends that just be dropped in the top bin...or maybe the bottom, which can hold smaller accessories. 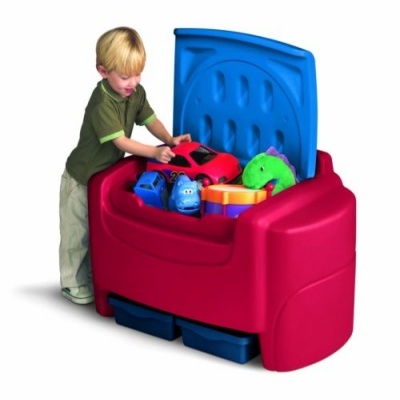 This toy chest is best to act as a holding space, rather than an organizer! The two bottom removable bins can slide out completely, so your child can carry their toy back and forth in drawers if they please! Made of durable plastic, it’s small size can save space in just about any room, and it’s light, durable construction makes it an easy transport. Made of 100 percent polyester, the Whale Toy Chest by 3 Sprouts may not look sturdy at first glance but it sure can hold quite a lot of your kids’ playthings. With 3 cubic feet of depository space, you can get 2 of these toy chests to make toy organization a lot more efficient, especially if your kid has plenty of toys. This is great inexpensive toy chest for the minimalist parent! Who says you need all the bells and whistles?! This 15x24x14.5 keeps it simple! The design is tasteful and blends in with the decor of any room….so, there’s no worry about walking into bright pink or red as soon as you open the door! The cardboard sides keep it erect and are deceptively sturdy, while the polyester lid remains at a whisper when being open and shut! This toy bin is very easy to open and close, making it simple for teaching little ones how to clean up after themselves! It has a unique way of capturing any kid’s fascination for animals especially those portrayed on PAW Patrol. It reinforces the things they have learned from the animated series. If your kids love PAW Patrol on Nick Jr., then they will surely love the Nick Jr. PAW Patrol Multi-Bin Toy Organizer. 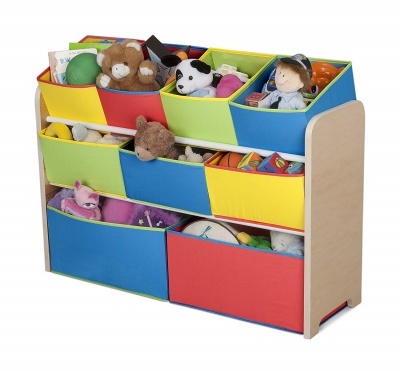 Made of both solid and engineered wood and durable fabric, this very colorful toy organizer is very useful. It comes with 3 small bins, 2 medium-sized ones, and a large bin at the bottom. If your child is between the ages of 3-6, they may not have to do much reaching at all as this designed to be their height. 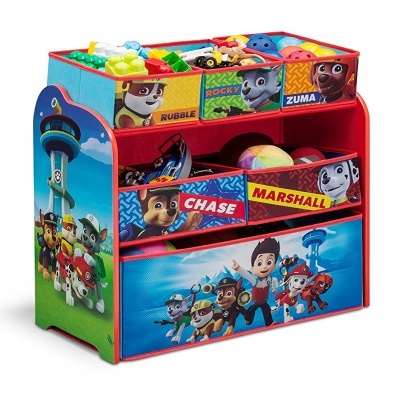 Your kids will have fun putting their toys in their respective bins represented by the main characters in PAW Patrol. 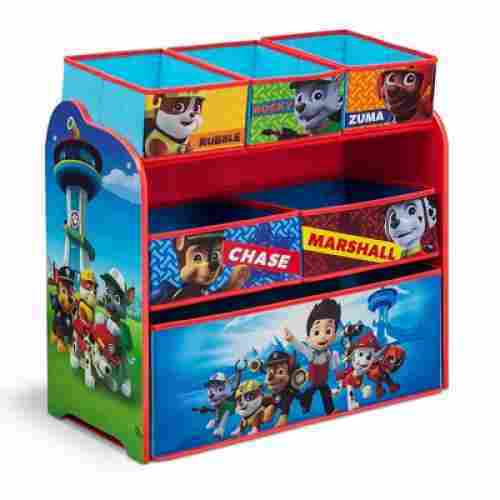 Along with Paw Patrol, there are fourteen other character themes you can choose from when purchasing this toy organizer. Whichever character theme you choose, the colorful graphics will stimulate your child’s sensory development while also getting them excited to use their bins. The bins are made of cloth and can easily be wiped with a wet rag to clean. The shelf is made of wood and proves to be very sturdy. You won’t have to worry about it tipping over on your child when they reach to get a toy. It’s a creative design and can serve multiple purposes. It’s nice that toys can be organized into the three separate bins, and one of the bins can be removed to use the chest as an ottoman if you need less depository space but another seat. Three separate bins mean you can organize and categorize toys if your family is at that stage of tidying skills, or you can mix and match whatever combinations fit the most toys in the dump truck! 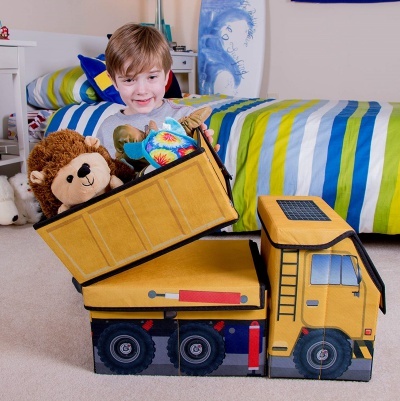 This dump truck is multi-functional and perfect for any construction enthusiast whose materials have wound up all over the bedroom or living room floor. 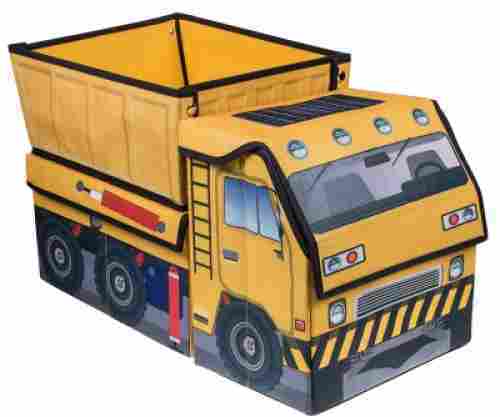 What better place to dump all of those stuffed animals and dolls than an actual dump truck? Clever Creations has found a way to make clean up fun and efficient. This truck is not only darling but practical. The three separate depository bins allow you the chance to help children work on sorting and categorical skills while cleaning up after themselves. This product is made out of sturdy, kid-proof material. If you have no need for it temporarily, simply remove the bottom (fabric covered) cardboard piece and fold the panels in to make it nice and compact. Remove the top bin and utilize the padded lid as a seat or ottoman for children. We love the fact that kids can use the lid for other purposes and they have two supply containers within easy reach. This can make for a very fun and exciting activity. If you need a multi-purpose toy box, you would want to get the 2-in-1 Toy Box and Art Lid from Step2. This toy box with an interior depot space of 4.5 cubic feet can double as an art table for your kid. He or she can use the art lid to draw, paint, or put puzzle pieces together. The topmost portion contains 2 bins which can accommodate art materials like pens, crayons, and other items. It comes as one solid block of toy box so there’s no need for complicated assembly. Most toy boxes and chests are pretty utilitarian -- one thing, but not the other! It might take some serious creativity on the part of child and parent to change this! But, with this toy that creativity can be directed into it’s proper outlet! All children tend to be born artists….well, why separate the activities of art and play?! With the depot component, all of your child’s toys and accessories can easily fit, while the detachable lid can act as a table/board they can place next to the box and draw on! Even better,the lid has a grooved tray to hold pieces or crayons in place at an angle when it’s still attached. This combination bench and toy box is classy, simple, and safe. It’s made from wood composites and is highly durable. It isn’t much of a statement piece, but it blends nicely with different styles, depending on the color you pick. This combination bench and toy box serves as both a depository facility for all of Juniors’ favorite playthings and a sturdy, kid-sized place to sit. A safety hinge prevents the lid from dropping down and crushing tiny fingers. The variety in colors available means it’s an easy piece to match, whatever your home’s aesthetic. If kids outgrow it eventually, it’s timeless enough that you could move it into most any room and use it to store any number of things: towels, extra linens, shoes, you name it! Toy chests give kids somewhere designated to put their playthings when they’re not using them. It helps parents teach organizational and sorting skills, as well as responsibility and cleanliness. This toy chest is simple, sturdy, and serves as a bench as well. Sturdy wooden construction can hold toys inside and support little bottoms on top, no problem. It’s available in seven different colors, including three different wood finishes. Assembly is fairly easy and there aren’t too many pieces to put together during setup. It’s compact but has enough depth to fit a decent amount inside. A hydraulic arm keeps the lid (which is heavy) from closing too quickly and saves fingers from getting pinched. 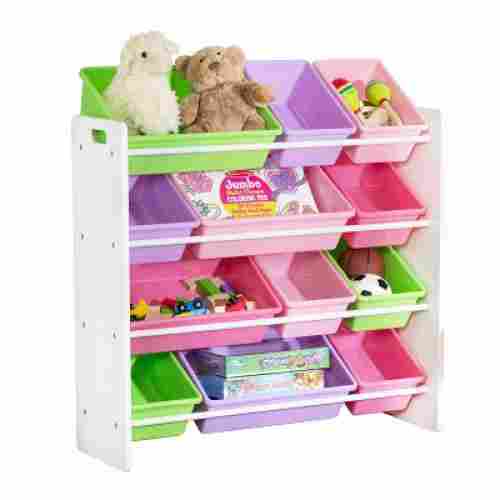 It is an efficient toy organizer that also helps in reinforcing your kid’s mastery of colors and organizational skills. We love the fact that all bins are removable. 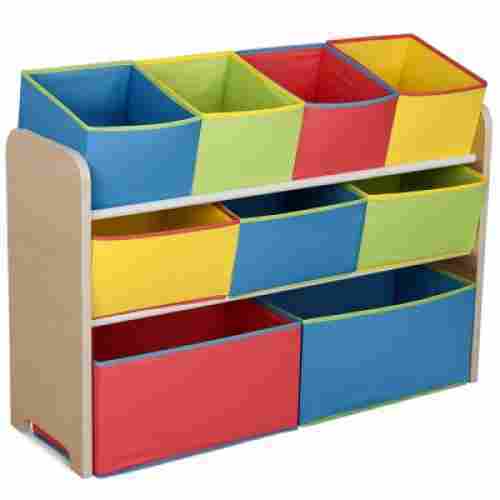 This 3-tier toy organizer from Delta is composed of 4 small, 3 medium, and 2 large bins in different colors. The top and middle levels are positioned at an angle to allow for easier identification of the toys required by your kids. This is a great tool not only for organizing, but in triggering innate pattern recognition in your child. Intuitively, they will begin to understand what things go on the “top” and what goes on the “bottom”. The bins are conveniently removable for those times when you just need to pull out the drawer and dig down deep in it to find what you’re looking for! 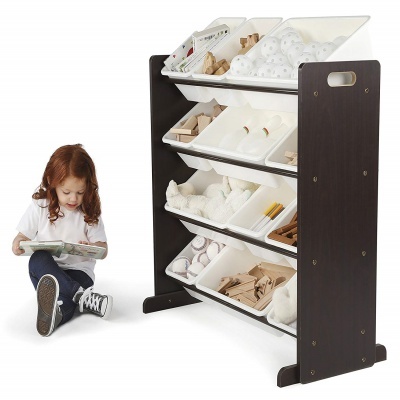 This toy organizer is made of wood with a classic natural finish. 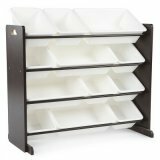 This product require minimal adult assembly, and is designed with a perfect geometric symmetry in the number and placement of the bins. It’s one of the more portable options. This is great if you have a large house and kids leave their stuff spread throughout, as it allows them to carry the toy box around with them while they clean up. It folds down when it’s not in use, so you don’t have to leave it standing around eating up space if kids are using all of the toys that usually occupy it. 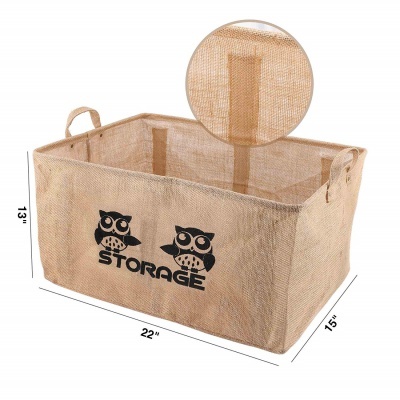 Cute little owls keep watch over the kids’ toys, and you can choose between four sizes, based on your particular needs. Users have all raved about the quality of service, so if your product is in any way unsatisfactory, reach out to the company and they’ll make things right. 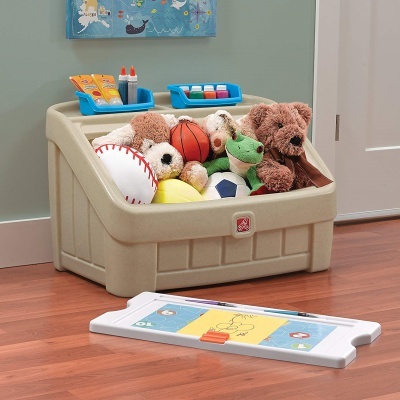 This toy box is portable and easy for kids to carry. They can grab toys along their own parade route, rather than dragging everything one by one to a big, clunky chest. Kids will learn the importance of tidiness and can do the majority of the clean up all by themselves. Gimar’s Basket Bin series features four baskets in varying sizes, all lightweight and easy to carry, but made to be sturdy and free-standing. A wire frame provides the stability, making it firm enough to hold your little one’s collections, and solid handles on both sides mean your child can take this from room to room gathering their things, if their latest adventures left toys strewn everywhere. With just six plastic inserts, assembly and breakdown are a snap. A waterproof coating means even bath toys can find a home here, and the box is easy to clean. Natural jute fabric is meant for durability and won’t easily rip or puncture. The basket is collapsible, so it can be stored even more compactly when it’s not in use, folding down to a single inch in height. The bins are lightweight so kids can carry them around wherever they want to play. The surfaces are very easy to clean and are made of durable materials so these are definite pluses. 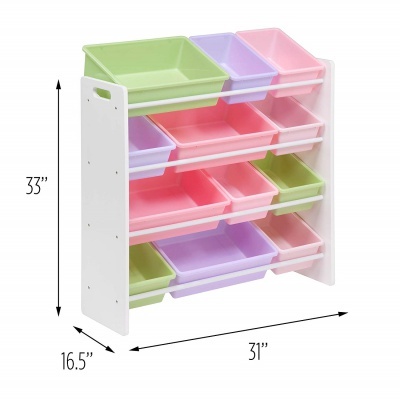 With its soft pastel colors, the SRT-01603 Kids Toy Organizer and Depository Bins can be a wonderful addition to your kid’s playroom. It has 4 levels that are positioned at an angle. 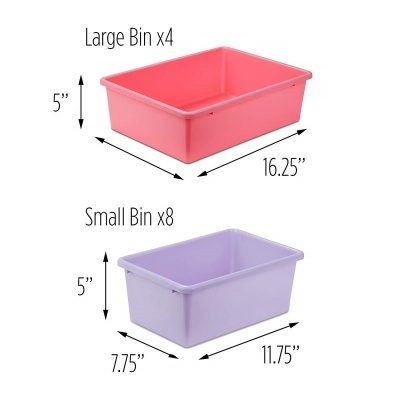 It comes with 4 large and 8 small bins in 2 soft pastel colors. 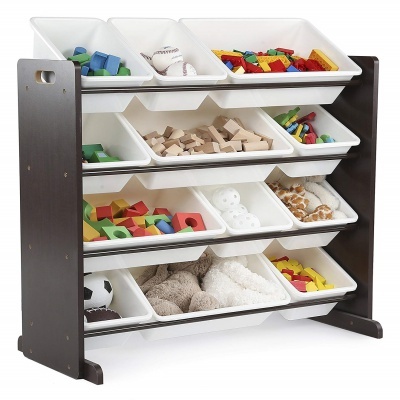 This toy organizer can be helpful in developing your kid’s organizational skills. These gentle white and pastel colored bins can make organizing a joy! Also, with the holding capacity of 12 separate containers, this can accomodate your child for years to come as there will be additions to their collection! 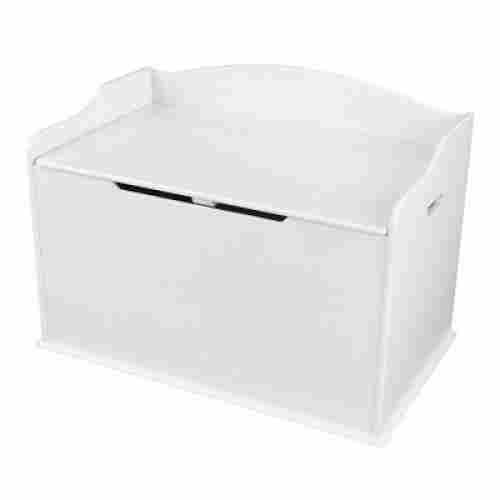 The angled position of the bins, make items easily detectable and within reach. It’s a good intermediary organizer from some of the handcrafted models. It is well-known that many kids and kid-friendly products aren't just for the kids themselves to use in solitude! Often, they are objects that parents have to share. Part of our search had to do with finding things that parents would never get tired of interacting with, either! We know how tough it can be as a parent...the hours and the days wear on, and it becomes harder to maintain enthusiasm for one more game, to hear that one song for the 1,000th time, to see that toy on the floor--heaven help us if we step on LEGO!--and, that one eyesore of a toy box that clashes with all the decorative style you might have had before you became a parent! This is why we've added in a few options for toy boxes and accessories that can blend in with the natural decor of the home. This is equally beneficial to the child because it gives them something to grow into, while subconsciously flowing into the world and value system of their parents. What comes to mind are the easily blended 3 Sprouts box and the Delta Children's furniture box. Both are optimal for greater socialization within a condensed period. These are all ways of strengthening the parent-child bonding relationship on another plane. We know the life of a child, and his or her parents can be messy! By its very nature, chaotic….but, that’s not what makes this world of ours go ‘round. The history of human development, by means of civilization, is built upon the principle of organization! While it might be said that a messy desk or workstation is a sign of genius--by the way, that genius probably has a few managers and assistants working for him--it wasn’t a gang of rocket scientists and mathematicians who laid the foundation of making sure everything was where it’s supposed to be. The most basic organizing tool, after the written list, is the depository space--the box, the bag, the sack, or the case. It’s been used to hold valued possessions, from papers and documents in other mediums to ornaments, trinkets, and jewelry, even the bodies of our loved ones after they have departed. It is an indication of value through preservation. Not only do we want to instill the principles of organization in our children as building blocks for greater achievement and acquisition, but we also want them to preserve what they create. It can start with something as simple as caring enough to pick up a toy. 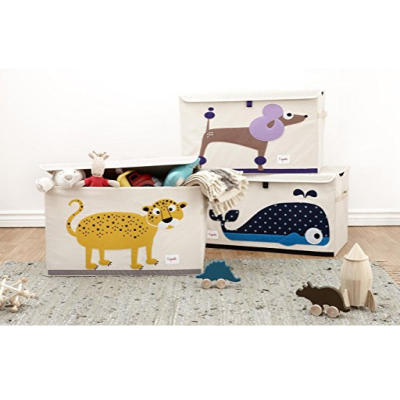 We want your kids to feel that their toy boxes are indeed their treasure and dream boxes. It is where they can keep their most prized possessions for playtime and make-believe activities. We made sure that all products listed in our best toy boxes are safe and that they are backed by positive feedback from parents like you. Of course, we also had to consider other factors like safety and the manufacturer’s reputation including the guarantees they provide for each of their products. We believe these are very important considerations for choosing any product for your kids. Toys are very important instruments in your child’s growth and development. They learn a lot about themselves and about their surroundings including the people caring for them. They need toys to help them reach their full growth potentials including mastery of both their fine-motor abilities and their gross-motor skills. They also help them learn and expand on their language and vocabulary, numbers and mathematics, and knowledge of common everyday objects, persons, and activities. They learn to play with other children and help them communicate a lot better while at the same time fostering social and emotional development. Toys encourage exploration, creativity, problem-solving, imagination, experimentation, and appreciation and understanding of everything that is occurring around the child. You simply cannot dump everything inside a big box or even an improvised toy depository made of an inflatable kiddie swimming pool. You will need a dedicated toy box that you can also use to teach your kids about sorting, classification, matching, organization, orderliness, and cleanliness. You can also use colorful toy boxes to help them recognize and reinforce their mastery of different colors and shapes. Now, some boxes come with a variety of features that can all be used to augment the things they learn from playing. That is why it is very important to choose the most functional box you can find for your kids. q: Aren’t some these depository racks too tall for young children--what if they can’t reach or it tips over? This is a good concern to have. First, take into consideration the age of the child you are purchasing this for. Second, understand that they will be under the supervision and that in some ways the organizer is just as much for you as them. If your child is very young, consider a more traditional, single, open bin. As for the tiered organizers, many parents have opted to purchase hardware separately in order to create a mounted safety feature. q: Is it impossible to buy a toy box with a lid that closes completely? Some products just might have a manufacturing error. With others, it may simply be a design feature for safety. As a parent, you can always get creative and find some way of developing latch to keep it closed. The other option is to shop around and take companies to task if you find a design flaw. Or, simply have a toy box custom built to your specifications. q: How easy it to keep these bins clean for when kids get really messy?! It’s fairly easy! With any mild soap and warm water, pretty much marker and crayon can come off. These can also be hosed down in the backyard with a regular hose or power washer. For anything stickier or more permanent, there is the product that should be every parent’s best friend, Goo-Gone!